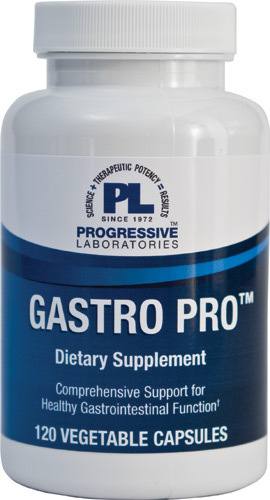 Gastro Pro is a "signature" gastro-intestinal support formula, designed by Dr. Mitchell A Fleisher, M.D., D.Ht., D.A.B.F.M., Dc.A.B.C.T. hydroxypropyl methylcellulose, rice flour, microcrystalline cellulose, vegetable lubricant. Contains milk. Two vegetable capsules twice daily, ideally between meals on a nearly empty stomach, or as directed by a doctor. Children between 2 and 6 years old may be given half of the above recommended adult dosage.